Here’s a story which is different, both in origin and outlook. Cixin Liu is a Chinese SF writer - the most prolific and popular one, sources have it (I cannot judge, so might repeat misinformation here). He’s the author of a good number of books and stories, some of which have been/are being translated into English; he’s the recipient of several Galaxy SF Awards, and two Nebula Awards (Chinese version, not the US/UK one we’re used to!). Anyway, it’s the most successful SF novel in China, ever, and has led to a (re)surgence of SF, and more generic acceptance of the form beyond its previous genre ghetto. The book is now (as of October 2014), translated by award-winning author Ken Liu and published by Tor Forge, and thus available to those of us with insufficient grasp of Chinese, too. The 2nd book in the series (Dark Forest) is planned for next year, and is translated by Joel Martinsen. The final instalment (cheerfully titled Dead End) will come out in 2016, and will again be translated by Ken (or by Joel, depending on which source you believe). I have no idea why Tor (who publish this book) advertise it as “the First Chinese Science Fiction Novel Translated Into English” - friends who follow the market in translated SF (and there is much more available than most people assume there is) strongly insist that it's not, except maybe for Tor. But either way, having more variety available in this US/UK dominated market is greatly appreciated, all the more so if it comes in the shape of such an engrossing and fascinating read. Yes, it's a step outside our comfort zone, outside our normalised societal expectations especially, and thus exactly what SF should be and do, in my opinion. The book starts with a list of characters, followed by the actual story, an Author’s Postscript for the American Edition (where he describes his background, and some of the drivers for the story), and the Translator’s Postscript, where Ken lays out how he approached the rather extensive task of moving someone else's work both between languages, but, especially and inextricably linked, also cultures. I was also wondering about the message he was trying to convey to his readers as the book progressed, and we see how China progressed towards a more ordered, and, in parts, permissive society - past = bad times, present = better times? Is it really that simple, in China? What is his degree of freedom in presenting his country if he wants to be published? The book follows the life of Wenjie Ye, who makes it through the Cultural Revolution alive (just), and ends up in a secret installation (Red Coast Base) which has a huge antenna, and is capable of sending messages – aimed at other star systems! - at a considerable power. You see, the Chinese military are playing some kind of reverse SETI, in the hope of, should there be contact with an Alien civilisation, the nation obtaining first access would have a substantial strategic advantage to gain. In parallel to Wenjie's life story, which is told chronologically throughout the book, we see a parallel, current-days thread following Miao Wang, a scientist involved in the development of practical applications of nanotechnology, and his quest, as part of his involvement in a multi-national Battle Command Centre (! ), of trying to figure out what is going on in the world of science. Why are series of prominent scientists killing themselves? What and who is the mystery organisation calling itself Frontiers of Science? What is its purpose? And what is this story about the laws of physics not being universal? No, you don't need a (particle) physics PhD to follow, no fear. All key bits are explained, in sometimes slightly stilted-feeling exchanges (it is, of course, hard to tell if that's the writer, a translation artefact, or a function of the societal setting) to other characters in the story. The book poses inherent and fundamental questions – like What is humanity’s worth? Given the choice, should we let humanity continue to live on Earth (or anywhere else)? Do we actually have any redeeming features as a civilisation, as a race, as a species? The author plays with his characters, who have their own opinions, but also with the reader… for me the answer to the above was not clear enough (I have a strong opinion on most of these), but we have two more books to go, of course! The story also contains an online game within it, which plays a rather important and substantial role, nominally found at www.3body.net. 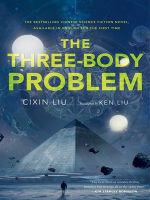 It requires a V-suit (haptic feedback suit), and simulates Chinese historical developments as well as world history, but set on a planet in a 3-sun system; the difficulty of calculating orbital data with any certainty in such a system is known as the Three Body Problem. The ‘what for’ is rather interesting, too… and no, I shall not spoil your enjoyment of this great book further! Overall I found this an interesting, engrossing, and engaging story. Some of it seems to have a very dreamlike feeling, with a convoluted logic, played out as a linear plot. The societal and behavioural norms had a tendency to feel very alien (do Chinese, or generally non US/UK readers of our standard SF fare get the reverse of this? Some exchanges I had with Aliette de Bodard suggest that the answer is yes, in most cases!). Fascinatingly so, though. We need more of this – more from this great writer, more Chinese (and other 'unusual') SF, and more of this story. Yes, this is a recommendation to go get the book, indeed.